I was blessed to be born into the Christian home of Sam and Gayla Reed in Waco, Texas. I grew up and went to church with my family in Pensacola, Florida and trusted Christ as my Saviour as a little boy. My formative years were spent at Charity Baptist Church under Pastor James McGaughey. Dr. McGaughey is a trusted friend and counselor, and his family is among our dearest personal friends. After graduating high school, I moved to Chicago to attend Bible college for training in the ministry. The best thing I got out of college was my wonderful and beautiful wife, Heather. Through the years, she has been my rock, supporting, loving and caring for me and our children. In 1998, we moved from Chicago to Arlington, Texas to begin working with Dr. Bob Smith at Trinity Baptist Church. Our family has enjoyed our time with Dr. Smith, a great Baptist preacher. Also, it has been a great blessing to work near my mom and dad, staff members at Trinity Baptist Church and Trinity Baptist Bible College. Feeling God’s call to help start more churches, I founded Global Church Planters, a non-profit ministry, in 2003. The organization helps plant churches around the world and to date, has helped start more than three hundred churches. This ministry has allowed me to travel around the world and speak in many churches and conferences, and meet people from many nationalities and all walks of life. 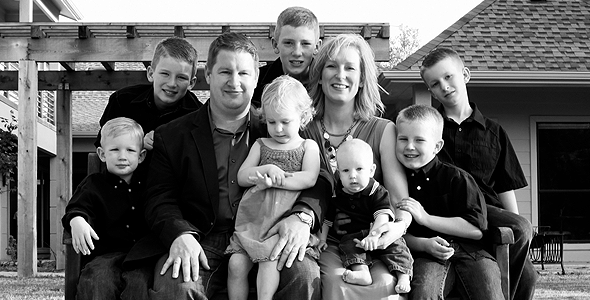 My family and I started Southlake Baptist Church in 2009. We are enjoying meeting and serving the great people of Southlake, Texas. I enjoy dating Heather, hanging out with and training our five boys: Jack, Josh, Eric, Matthew, and Tyler, Abby, and Jacob, pastoring a growing church plant, frequenting Starbucks, and traveling around the world. My personal goals are: to be a great husband, effective father, encouraging pastor, and see thousands of churches planted around the world. I just wanted to send you a quick note to let you know that NLC is praying for you and your launch tomorrow. 11 months ago we launched NLC with 219 people and it has been an amazing ride ever since. I know that you will do extremely well… you are a heck of a leader. Thanks for being dangerous. Hi Clay and Heather, Kim Davis here, we received your Christmas card and we were so glad to hear from ya’ll. We would love to get together for dinner. Ya’ll let us know if you would like to go sometime soon and what day is good for you. Hope to hear from you soon. By the way, Jacob Kent is just adorable, looks like all the other boys! The kids are getting so big. Tell them to stop that! Hello Clay, I was researching some family history and wondered what line of the Reed family you descended? Mine dates back to Clayton Claiborne Reed from Dublin in 1699, then to William, Sr, William Jr, Robert, Alfred, John Wesley, Boyd, Raymond, and then my dad Sam. It is interesting to find another Clayton Reed online. My wife Heather & I live in Arizona. If you have the time it would be interesting to hear if you from the same family line. I hope this finds you well. What Bible college did you attend in the Chicago area? I went to Wheaton and my husband went to North Central. Best wishes as you grow in Christ. We will visit next time we are back in Southlake.